Chromium is naturally occurring at low levels. Trivalent chromium is essential to health. Hexavalent, or chromium 6, is dangerous to health. At higher levels, it is a suspected carcinogen and can damage DNA, the liver, and kidneys. Hexavalent chromium was added to prevent corrosion in the LANL cooling towers. 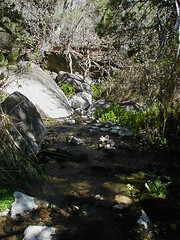 From 1956 to 1972, LANL flushed this cooling water into the headwaters of Sandia Canyon, which flows to the Rio Grande. A plume formed in the regional drinking water aquifer, at approximately 1,000 feet below ground surface, below Sandia Canyon. It is migrating south and east below Mortandad Canyon to form a kidney-shaped plume. LANL recently reported the plume is migrating northeast towards a Los Alamos County drinking water well called Pajarito Mesa 3, or PM-3. The New Mexico Environment Department issued two groundwater discharge permits for remediation of the plume. One permit allows for the extraction, treatment, and re-injection of the treated waters back into the regional aquifer. The other allows LANL to land apply the treated waters over the floodplains of Mortandad Canyon through the use of sprinklers and water trucks. On Sunday, August 5th, the conversation will take place from 1 pm to 4 pm at Barrios Unidos, located at Seven John Hyson Drive, in Chimayo. https://www.barriosunidoschimayo.org/ Because of limited space and resources, it is requested that you attend the event that is most relevant to you and your community. Please RSVP online at goo.gl/xqGPmW or by phone at 505 747-3259.